The only home buying contingencies that matter in states like New York where properties are sold as is are the financing contingency and the sale contingency if you need to sell in order to buy. Other typical contingencies for a home purchase such as the appraisal contingency and the minimum loan amount contingency are already included in most financing contingency clauses. The mortgage contingency gives home buyers a set period of time after a contract has been fully executed to back out if they can’t secure a mortgage commitment letter. The contingency period is negotiable, but it’s common to see 45 days as a typical term for the mortgage contingency. The mortgage contingency is very useful for a buyer who went into contract quickly and didn’t have time to go very far in the mortgage underwriting process yet. This can happen if the listing was very competitive, and the buyer felt like he or she needed to sign a contract quickly in order to secure a deal. Because of this sped up timeline, the buyer likely wouldn’t have had time to do much more on the financing front than to secure a mortgage pre-approval letter. As a result, the mortgage contingency gives the buyer a reasonable amount of time to work with the mortgage broker or bank to secure a commitment letter after contracts have already been signed. If no bank has agreed to provide the buyer with a commitment letter by the time of expiration, then the buyer can walk away after formally notifying the seller’s attorney. In practice, buyers who haven’t received a commitment letter by the time of expiration won’t have received a rejection yet either. Perhaps they have a more complex financial situation that takes more time for the bank to underwrite. As a result, buyers have a tough decision to make at this point on whether they want to automatically waive their contingency by doing nothing, or cancelling the contract and backing out of the deal. More often than not, buyers seem to waive the mortgage contingency automatically by not backing out because they’ve become too invested in the idea of buying the home. They feel that worst case, if they can’t get a conventional loan, they’ll secure one from a hard money lender or a relative. Please consult your lawyer and carefully think about this before doing anything rash if you find yourself in this situation! Pro Tip: The mortgage or financing contingency is the most common contract contingency seen in residential sales transactions. In fact, it’s the only standard contingency you might see for the vast majority of offers made in NYC. The appraisal contingency allows a buyer to cancel a fully executed contract if the appraised value comes back at too low of a value such that the bank cannot loan at the originally intended loan-to-value and loan amount. The appraisal contingency is unnecessary in many states like New York because it is already included in the default financing contingency that comes with the New York Bar Association condo and coop contract of sale. 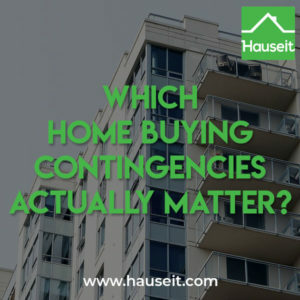 This contingency is included by default in many template financing contingency clauses because buyers by default won’t be able to complete a deal if the bank refuses to finance because of a low appraisal. As a result, the bank approving the appraisal is a basic condition for any transaction that involves financing. Pro Tip: A low appraisal can be a real nightmare for a deal. Read our article on how to challenge a low appraisal in NYC to learn how the appeal process works. A minimum loan amount contingency specifies the exact loan amount that the buyer will be seeking, and allows the buyer to exit a signed contract if the bank refuses to lend the anticipated amount. This contingency is especially useful if the buyer paid a high price and suspects that there won’t be sufficient comparable transactions to support an appraised value equal to the contract price. This contingency can also be helpful if the buyer is not a “shoo in” applicant, and is not super financially qualified and thus almost certain to get approved for the amount of financing sought. Keep in mind that financing related home buying contingencies such as this and the appraisal contingency are already included in the stock New York Bar Association contracts for condos and coops. Pro Tip: Read our tips for the mortgage loan process in NYC to learn how you can finesse the mortgage underwriting process. That last thing you’ll want to do is to botch your loan approval process and get offered less than you anticipated! 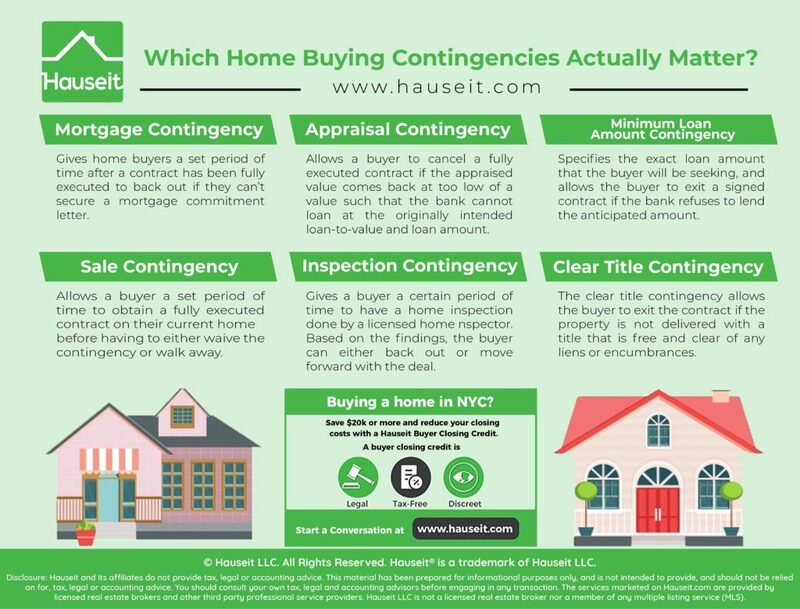 The sale contingency, also known as the Hubbard Contingency, allows a buyer a set period of time to obtain a fully executed contract on their current home before having to either waive the contingency or walk away. The house sale contingency is extremely unattractive for home sellers because they will have little insight or control in the buyer’s own sale process. Assuming the buyer needs to sell in order to buy, there’s a high risk that the buyer won’t be able to find a buyer and will thus have to exit the deal. Sellers can typically continue looking for other buyers during the contingency period; however, the seller must give the buyer an option to waive the contingency if another buyer is found. Otherwise, the seller has a right to cancel the original buyer’s contract and to proceed with the new buyer. Pro Tip: Read our complete guide to selling a house in NYC to learn how you can sell your home, from A to Z. Everything from selecting an initial listing price to how to manage the offer to closing process. The inspection contingency provides a buyer a certain period of time to have a home inspection done by a licensed home inspector. Based on the findings, the buyer can either back out or move forward with the deal. Depending on the exact contingency language, the buyer can also negotiate after inspection for the seller to make repairs or provide a concession on price. Inspection contingencies are unheard of in states like New York where properties are typically sold as is. In New York, the principle of caveat emptor (“buyer beware” in Latin) applies and it’s up to the buyer to do their own due diligence before buying a property. In fact, the seller property disclosure form in NY is typically not filled out, and instead the seller will credit the buyer $500 at closing in lieu of doing so. In states like New York, what typically happens is that the buyer will ask for and do a home inspection prior to signing a contract, but typically after they have an accepted offer. Of course the seller could deny the buyer’s request, but in that case the buyer could just walk away because offers generally don’t mean anything until contracts have been signed. As a result, in most states that follow New York’s example, there is no need to make inspection a home close contingency. You simply do an inspection before signing a contract, and if you don’t like what you see you can re-negotiate or back out before signing a contract. Pro Tip: Should you get a home inspection before making an offer? We’ll explain why this may not be the best course of action, especially given the high cost of services in metropolitan areas like New York. And if you’re buying a condo or co-op, make sure to read our article which answers the often asked question of should you get an inspection before buying a co-op in NYC? The clear title contingency allows the buyer to exit the contract if the property is not delivered with a title that is free and clear of any liens or encumbrances. (b) Any unpaid taxes, assessments, water charges and sewer rents, together with the interest and penalties thereon to a date not less than two business days following the date of Closing, and any other liens and encumbrances which Seller is obligated to pay and discharge or which are against corporations, estates or other persons in the chain of title, together with the cost of recording or filing any instruments necessary to discharge such liens and encumbrances of record, may be paid out of the proceeds of the monies payable at the Closing if Seller delivers to Purchaser at the Closing official bills for such taxes, assessments, water charges, sewer rents, interest and penalties and instruments in recordable form sufficient to discharge any other liens and encumbrances of record. Upon request made not less than 3 business days before the Closing, Purchaser shall provide at the Closing separate checks for the foregoing payable to the order of the holder of any such lien, charge or encumbrance and other-wise complying with subpara. 3(b). If the Title Company is willing to insure Purchaser that such charges, liens and encumbrances will not be collected out of or enforced against the Unit and is willing to insure the lien of Purchaser’s Institutional Lender (as hereinafter defined) free and clear of any such charges, liens and encumbrances, the Seller shall have the right in lieu of payment and discharge to deposit with the Title Company such funds or give such assurances or to pay such special or additional premiums as the Title Company may require in order to so insure. In such cases the charges, liens and encumbrances with respect to which the Title Company has agreed to insure shall not be considered objections to title. Pro Tip: Read our guide on selling property as is in NYC. Remember that properties by default are sold in “as is” condition in the state of New York and the many states who follow New York’s example. 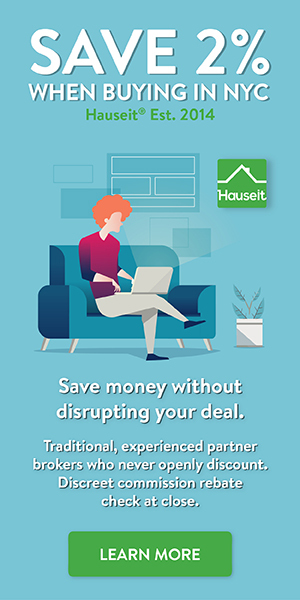 If you happen to be buying, then read our counter guide on buying a house as is in NYC to learn how buyers should deal with this situation. What is a Hubbard Contingency for NYC Real Estate Transactions?